The future has a long history in art. Romantic painters loved to picture what the great buildings of their time would look like as ruins. The architect Sir John Soane commissioned the artist Joseph Gandy to paint Soane’s masterpiece the Bank of England not as it looked when spanking new, but as the grand vision of decay it would one day become. Soane’s apocalyptic fantasy of his own building was probably influenced by the French painter Hubert Robert, who in 1796 pictured the Louvre as a roofless ruin overgrown with weeds. The art of Pablo Genovés resurrects and restages such visions of architectural catastrophe. In his series Precipitados, this contemporary Spanish photographer creates grand European interiors – opera houses, libraries, baroque palaces – in which floods of water or seas of sand push against bookcases, inundate staircases, crash into wrought-iron gates. 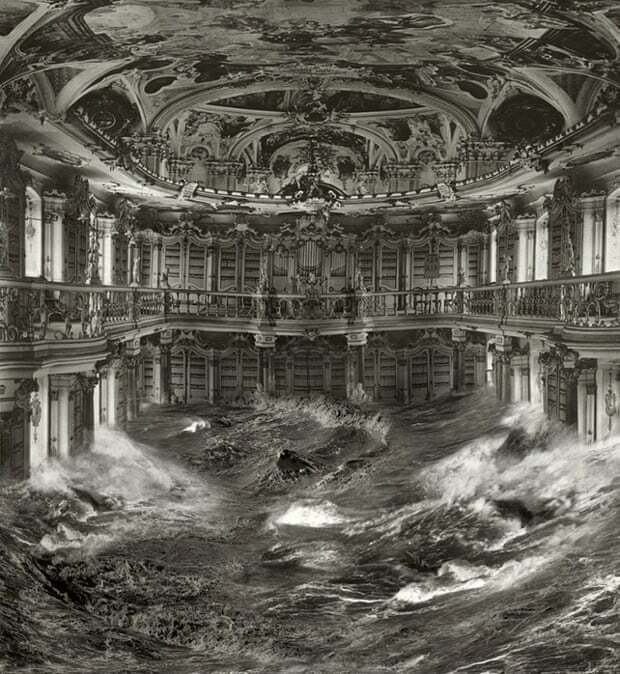 Books and art, memory and history are all about to be lost ... Bibliothek (2009-2015). In one picture, Genovés imagines the sea surging into the Louvre’s Grande Galerie – a direct quotation of Hubert Robert’s sublime dreams. It is his passion for European architecture that makes this horror picture show so distinctive. The power of these photomontages is in the collision of timeless cultural grandeur with overwhelming natural destruction. The imagery is haunting: books and art, memory and history are all about to be lost. There is, of course, one great difference between earlier artistic impressions of the end of civilisation and these contemporary cataclysms. Today, the end of the world as we know is not a romantic fantasy, but a potential reality. Overwhelming scientific evidence minutely charts human-caused climate change. Sombre analyses carefully map the likely consequences of melting ice caps and rising sea levels on a precise timeline. We can’t look at these surreal images as playful acts of imagination; they are reasonable predictions. Nightmares that have already been seen ... Superconectores (2011). These nightmares have already been seen, not as art but as news. Hurricane Katrina caused scenes as strange and monstrous as those by Genovés. 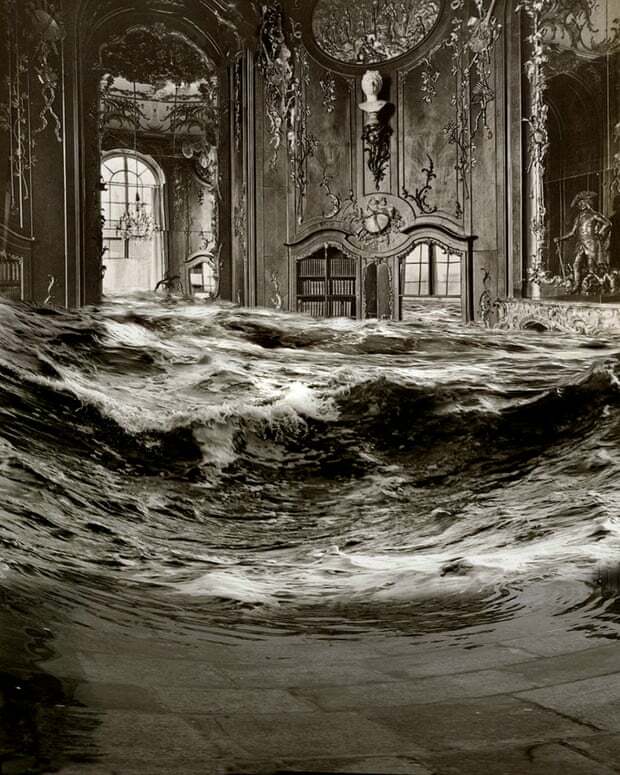 When part of New Orleans lay underwater a decade ago, photographers did not need any special effects to find apocalyptic images of inundation. Hurricane Sandy afforded similarly stupendous images of devastation on the east coast of the US. The west of England also became a diluvial waterscape in February 2014. Genovés creates haunting visions of apocalypse with the enthusiasm of a consummate catastrophist. But every day the flood becomes less mythic; every day, the evidence grows to make these monstrous images more prosaic. The elemental death of civilisation was once a dark theme for imaginative artists. Today, it is a pressing and all too real emergency that our imaginations struggle to comprehend. Would Scottish independence unleash a British art identity crisis?